I doubt if there’s any student that has had to climb the mountain called UTME that does not have anything to say about it, whether good or bad. Trust me, more negatives than positives. This is one word (permit me to use that) that has the power to TOTALLY and COMPLETELY disorganize a “Jambite”, I mean, a prospective candidate. I cannot be wrong if I assume that a UTME candidate was asked his birthday and he blurted out his UTME test date; and I don’t know if it is just me or someone else had noticed it too – that there are three places that are usually the most populated during the UTME period. First, places of worship (churches and mosques), next, libraries and the last but not the least, tutorial centers. Before I go on, let me quickly acknowledge the fact that Nigerians have this funny attitude of assigning wrong names (or slang) to different things to suit them better, and funny enough, it turns out to be interesting. For example, JAMB which stands for Joint Admission Matriculation Board is now the “official name” for the examination instead of the original UTME – Unified Tertiary Matriculation Examination. So it is very common to hear people say, “Have you written your JAMB?” instead of “Have you written your UTME?” or “Have you sat for your UTME?” Quick confession, it actually sounds “sweeter” to say, “Have you written your JAMB?” compared to “Have you sat for your Unified Tertiary Matriculation Examination?” – All thanks and no thanks to “Nigerian English”. (I’ll tell you why later). So permit me to use “JAMB” as a substitute for “UTME” in some places. It is also not uncommon to hear an unprepared candidate tell another, “Musa, I didn’t read enough, but Insha Allah, I will pass”, even when he knows he started reading 24 hours before his screening date. Worse still, that is the time Gbenga will remember he has one “Baba” in the village that can give him a “magic ring” or “invisible eyeglasses” to enable him see the answers already ticked for him. Well every man for himself. It was an opportunity for me to write my first JAMB in a boarding school. Don’t laugh at me, I wrote it only twice, and I passed both. Let’s just say “things” happened. And if you have written it more than two times, don’t be discouraged at all because your success in life is not measured by your JAMB score. This lady (@opsy_hustle) totally agrees with me. I can recall vividly the time I wrote mine; I had first-hand experience. If you ever attended (or you’re in) a boarding school, kudos. My experience in boarding school was beautiful. Those who did will agree with me that the only thing you hear on the day of “re-printing” is, “When is your own date?” or “Bros, when you dey write?” As usual, people will start praying deep down in their hearts for their dates to fall later than those of their close friends. I still do not know why but I think it is for them “to have hope” if their friends tell them was fine. On the day of examination, the day of reckoning, the day when you can actually have an idea of the possibility of gaining admission that year or waiting another extra year, candidates wake up earlier than normal for their last minute revision (which I am totally against personally), cross check their acknowledgement slips about a hundred times and head for the “judgment ground” – the examination center. Then exam begins after thumb printing (new method introduced with CBT – Computer Based Test) or photo card checking exercise (old method associated with PPT – Paper Pencil Test). Then after the exam (Ghen ghen *action movie soundtrack*), candidates begin to troop out of the hall. More than half of them will reply “it was fine shaa” when asked how the exam was. Only a negligible number of candidates can actually boast that they “scattered” JAMB. Fortunately or/and unfortunately, only about half of the total number of candidates, over 1.5 million, pass the examination. Fortunately because you have crossed your first major admission barrier and your pastor can now stop making this prayer point – “May JAMB not jamb you this year”. Unfortunately because another barrier awaits you and that is Post-UTME. One advice, if there is an obstacle preventing you from achieving your goal, do not change your aim but change the direction to your destination or even tear down the barrier. Oh! The tension and suspense of waiting for one’s preferred varsity to release its UTME cutoff mark can send a “Jambite” to early grave; but you know what Newton said, “for every action, there is an equal and opposite reaction”, in this case, it is no different. If only people can “see” all the curses and insults (and in Naija language, the swear) that the JAMB registrar has received eh, you will pity him. Prof. Dibu Ojerinde “chopped” it seriously from the 2015 UTME candidates, especially prospective UNILAG students when cutoff was rumoured to have been fixed at 250 as compared to the usual 200 and students posted to other varsities contrary to their preferred choices. Affected candidates and their parents took to the street to protest the cutoff and express their grief and shock. They even dragged JAMB to court and suggested a compulsory resignation to the Registrar. How that case just died down, I was marveled. Lastly, to pass your UTME in flying colours, you should prepare very well, if possible, 7 months before your exam date with intense studies. The role of past questions cannot be over emphasized. Forget all those “dubs” and “chukilis”, they only make things worse. Just commit everything into the hands of the creator. *Adjusts native red cap* *clears throat* – like a village elder. Future candidates, let me pray for you. May the gods of our land keep you safe and protect you that JAMB will not jamb you; but first, the gods have to wash their mouths with 1 bottle of dry gin. Also bring along a day old crocodile, five fingernails of a polar bear, one eye of an earthworm, the ventral fin of a 4 year-old shark and a golden lizard. And if you have testimonies and experiences to share concerning JAMB, feel free to use the comment box below. Francis my great friend, even though am a university student, i’m dazed at this write-up and am very sure you are going to change the lives of people with this and I strongly believe that I can beat my chest anywhere that you are going to be a great person,and that’s my prayer.You are a blessed person.People will send for you from the North,South,west and East in your life time.You will be someone I’ll never forget in my life.I wish I had this gift of yours to write(laughs)But God will give you more insight to keep on writing and achieve that dream I know you wanted since our days at the boarding house..Guy am proud to say am your number 1 fan and your a true friend I can boast of anywhere.Love you brother.And a great future ahead. changing the mindset of people is not easy task. Am glad u are doing this in a great way to impart lives. Failure is never a bus top, it’s only an avenue to be courageous and forge ahead. 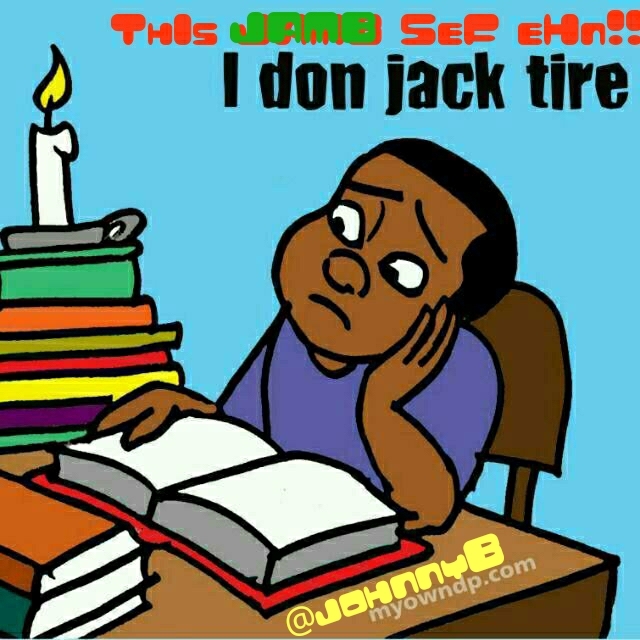 When preparing for ‘jamb’ and or any other examination, you need to stay focused, be prepared, be optimistic, rely on yourself not on any1 and trust ur instinct. Most importantly leave all in HIS HANDS. Bro may HE continue to fill u wisdom and understanding to feed others. keep d fire burning DOT. Hmmmmm this is nice Francis. I have had a taste of UTME and would say it’s challenging. I feel this write up would do alots of good to some people and I think its quite thoughtful of you to cook this. God will continue to empower you with more beautiful write ups kudos dear. Nice write-up.But then i believe the issue of a student passing any exam is based on the mindset,smartness,school(in this case sec. school) and moral standard of such a student.I believe it doesn’t take a genius to pass an exam.A student with a positive mindset will never see any exam as a mountain barrier but as a regular slight hiccup in the stomach which with patience can be easily passed out wit ease.Exams are a necessary ingredient in the life of every student the moment any student accepts this simple fact,with time,the mirage created by the Nigerian educational system that every standard examination is hard will disappear.An exam is supposed to be a check on students who do not revise what they have been taught in class.But this is not the case in Nigeria,as exams at various levels are just a test of what the students are supposed to know and not what they were taught.In a country where most schools can not boast of a standard labaratory much less a practical session.Even though some people might argue that this method of setting helps to breed ‘super smart’ students but take a simple case of taking ten blind men who have neva left the confines of their compound to an express road then u expect them to cross without getting hit.We Nigerians have gotten used to the ‘suffering and smiling’ state of life that abnormalities in oda countries are the norms here in Nigeria.Most times we Nigerians in our haste to ‘westernize’ part of our system forget two important words CAPABILITY and DEVELOPMENT.We tend to forget that before a child starts walking he must crawl first.The introduced CBT exam (which is a good idea by the way) by JAMB is a good example.This initiative should not have been compulsoried.Nigeria isn’t just ripe for this.I do not know of other states but in Lagos there were different cases of faulty computers,irregular timing,impromptu log outs and different silly issues which were of no fault of the student but will no doubt cause another automatic year at home for such student.But then this is Nigeria where a student is like an ant at the feet of an examination body which is run on taxpayer’s money and with the money of the form bought by students.Since JAMB seems to have confidence in its CBT exams as cheat-proof.I see no reason why post utme should not be scraped. I nearly passed out cauze of the Laughter this writing created! Jeez! This- as hilarious as it sounds- is the daunting truth. I must say that I ain’t surprised. Cauze it’s just what my canny friend is Blessed with. He has the ability to bring a whole new light to things with captivating speeches and writings. I won’t be surprised if He got a national recognition for this one! Big ups Brahv! Keep the flag flying. it will never b a test of knowledge, its only a test of Grace,fortune,smartness,nd Favour frm above….. I really do like this! I also love the overall structure of the blog as a platform where other writers can share their works. 🙂 well done. Thanks a lot dear! I appreciate..